Negotiations are underway to consolidate faith into the perfect belief system. Auroville, the Ashram for the Bauhaus cult of mystics have entered into active talks with Sai Baba. Sources say, the intent of the talks is to entice Sai Baba to move his ashram to the Golden Orb of Matrimandir and install his throne within the bowels of this modern, air conditioned, concrete shrine. Here he could hold court and enhance both groups. If successful there are plans to consolidate the Mormons, Baptists and Lutherans as well as various Muslim sects into this new Center for Spiritual Awareness. A letter, in Hebrew, has been sent to the Hasidim of Palestine to entice the squatters on the West Bank to join in this unparalleled enterprise. This new movement will promote and appeal to brotherly love and understanding of all things great and small. 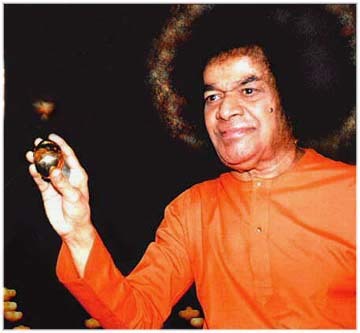 Sai Baba can demonstrate the power of vibhuti while other faiths have offerings to enhance the spiritual experience. The Vatican has been informed but, at this time, declined the notion participation. Western theologians could learn from the pages of his book. If Western Clerics would concentrate on creating 'an opiate for the masses' rather than interfering with the workings of society, our social systems would be free of intrusive acts by 'The Men of God'. They would be appriciated for their showmanship and colorful costumes. The Pope and his lot are a bit severe for mainstream worshipers but an amalgum of Pop mysticism, Catholic garb, acrobatic flexibility and ruthless showmanship might just win the day for religion and contemperory theology. Clearly something needs to be done for those with a calling. God Only Knows just how many are in need of mystical experiences and rebirthing debriefing. Consolidation of mystics and those aspirants would localize the problem, there should be a homeland for these miscreants to ply their trade without incumberence to normal life, a place to make magic without distraction from pressing events that bedevil the average global citizen. Sai Baba a perfect role model for his faith. Sai Baba keeping his eye on the ball. Orb Energy is power. Young lion avatar getting his chops by levitating an orb. Over time he gets better and better. As an Avatar there are expectations to produce and that he does; for decades he has been spewing forth stuff and things both marvolous and banal for the astonishment of his following. Perhaps Indian religions (like the Zoroastrian religion, which was so inextricably tied to the Persian Kingship) are tied to a finite range of values along a graph of social evolution; and outside that range these religions no longer engage the world meaningfully. Atavistic Avatar: Throned, it's lonely at the top. Holding court, Sai Baba with feet nested comfortably on his tiger-head ottoman; he sends his love to us out here in audience-land. Clearly he is our man supreme when it comes to all things mystical. Atavistic atributes by: Sai Baba the magic machine. Sai Baba, Avatar: The Old Man continues to make more magic as he has done for some 50 years; a career huckster still on the make, insatiable and undaunted by any thought that his "performances" are anything but stupefyingly dumb, he carries on today making magic for millions, vibhuti, vibhuti vibhuti pours from every orafice. "The concept of Brahman, the Ultimate Conscious Reality, manifesting itself as the Universe, and Its being the material and the efficient cause for creation, represents the pinnacle of philosophical quest. Yet, the cognition of the truth of the Immanence of Brahman is difficult to achieve, for it is impossible for man to rend the veil of Avidya or Maya. Such understanding of Brahman comes best to man when the Lord vouchsafes 'Viswavirataswaroopa Darsana' to the ardent seeker - not by jaded disquisition of self-designated philosophers." "Toxic Waste  No Problem"
"I will get around to toxic cleanup when tributes are paid.". "Lumpen folks  No Problem"
"Lumpen strokes for lumpen folks"
"Crass Struggle  No Problem"
"With tributes paid to me, I will make everyone rich"
"Celestial Signs  No Problem"
"Both Cosmic Signs and Celestial Signs are transmuted through me to be interpreted once tributes are paid." "Rebirthing Debriefing is the answer, transmuted through me is the coda for understanding the meaning of life once tributes are paid." an aura of profound meaning will penetrate the confused climate of Auroville, a brighter day is soon to come to fill the hearts of those who wish for meaning, meaning at any cost, to include self respect. "The inquiring mind is a toy, like clay, that can be molded into whatever I wish. Gullibility is a terrible thing to waste, spiritualism is My means to touch the soul to fill a tabula raza with my spirit." Sai Baba stated in a press conference last year 7/15/2002: " I am responsible for George W. Bush winning the 2000 election. Without my intervention Al Gore would have won. I diverted voters from the polling stations. I designed the Butterfly ballot and finally, I influenced the Supreme Court in a bilocating appeal while I was lying in bed." There is now uncoverd solid evidence of his assertion. Other instances of Baba's powers of resurrection are known to other devotees. The Raja of Ventagiri told me of his experience when, some twenty or so years ago, he witnessed Baba's resurrection of a man dead some six days in whom body decomposition was taking its normal course. About these mysteries, one can make no comment; they are outside the customary human experience. Life is like a bean stock and Sai Baba is like an Avatar. "Miracles are my visiting cards"
he says and on another occasion "My greatest miracle is Love of Miracles "
Lemon toss performance art,: presentation is everything, as Sai Baba tosses lemons into a silver bucket. 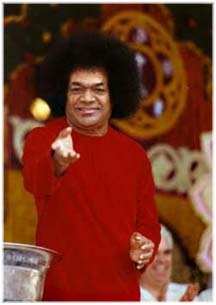 Anyone can toss lemons into a bucket but when Sai Baba does it something magic happens. First, he needs a crowd, any crowd will do but westerners are preferred. second, there are rituals and, there is the silver urn and last one needs lots of vibhuti. From the very first of his known Discourses (25 or 26 October, 1947 - Vijayakumari, pp. 107-109) and from officially recorded Discourses in 1953, Baba makes strong claims to be a living incarnation of God (in Hindu terms, an Avatar, or descent of God on earth). He also makes frequent allusions to the Divine powers of Omnipotence, Omniscience and Omnipresence. A further strong claim of his is to be the second of a series of three consecutive incarnations of God, beginning in the 1830s with Shirdi Sai Baba. More anecdotal (but very frequently discussed among devotees) is the claim that a third incarnation, Prema Sai, will appear soon after Sathya's predicted passing in 2022. "My Children! God has come in human form only for the sake of His devotees. He is born to destroy the evil people, and save the good and the gentle." One morning as I was driving to work, I stopped at a light, and glancing to my left, saw what appeared to be a snake in the next lane coiled up with it's head up and waving around. Since I'm an animal lover, I was concerned that the snake would be squashed by a car, so I immediately got out of my car to rescue it. The snake turned out to be a piece of rope. Why the end of it was up and waving around was a mystery, since it wasn't windy that morning. Sometime after that, I read a quote by Sai Baba that said reality is like seeing a snake in the road and being frightened. But when you get closer, you realize it was just a harmless piece of rope but if you see what you take as a piece of rope and it's a snake. whoa, look out. Wow, I know what he means. Fred also mentioned being in someone's home, and telling the couple who lived there that Sai Baba would never materialize money for a devotee (this before the previous incident). As soon as he said it, money started showering like rain out of the ceiling. He then heard Sai Baba's voice say, "Don't tell people what I will or will not do." His deep voice echoed like in a cavern. Amongst the 'Sai Stories' told by devotees are some very strange tales. For example: Knowing that every Rolex watch has its exclusive serial number, an Australian visitor asked the swami to materialise one for him. 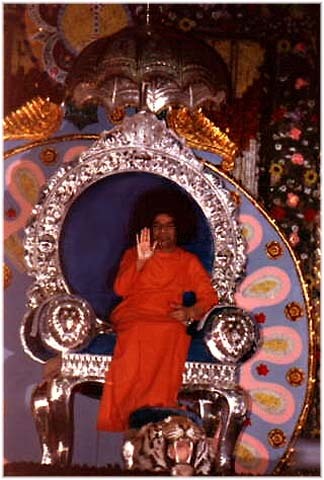 Sai Baba obliged with a wave of his hand. On his return the serial number enabled the Australian to identify where the watch had been purchased. He asked the proprietor if he remembered who bought it. The owner remembered the occasion well. He could hardly forget the unusual orange clad Indian gentleman with strange fuzzy hair. The shop owner was a meticulous man who kept accurate sales records that gave not only the day of purchase but the time as well. Together they checked the records. It corresponded exactly with the time and day that Sai Baba had materialised the Rolex. String Theory confirmed, Sai Baba had been in two places at the same time! Worm holes do exist. Sai Baba's most frequent materialisation is of a healing ash called vibhuti. Hindus consider this to be very holy and on a par with the holy sacrament of Christianity. In the Daily Telegraph of March 6th 1994 a reporter witnessed vibhuti ash forming on photos of Sai Baba and objects in the room at the home of V. S. Naipaul in Kensington, London. In honour of Sai Baba's 70th Birthday, Sir Vidia carved a life-size wooden statue of his guru. As soon as the task was complete vibhuti ash began to form on the statue's hands, gown and feet. Mr. Naipaul took a photograph of this but when the film was developed it was not the statue in the picture but a photograph of the real Sri Sai Baba! Wow, I know what that feels like, I've taken lots of photos that didn't turn out. Another intriguing story, although accounts differ, concerns an Australian who visited Sai Baba in the hope that he could cure his wife of terminal cancer. Sai Baba spoke to him saying "You shouldn't be here. Your wife needs you. She will be well." He then tapped the Australian three times on the forehead. The man vanished in front of a crowd of people and reappeared besides his wife's hospital bed in Australia. Baffled by what happened he checked his passport. It was stamped correctly with that day's date yet only moments ago he was in India. His wife recovered, but died two months later in an train wreck. The reports coming out of India are mind boggling. Sai Baba has raised the dead, multiplied food as Christ did at the Last Supper, materialises jewellery out of the air and turned water into petrol when his car ran out of fuel. He has turned petrol into soda for thirsty devotees. There are tales of him materialising sweets directly into people's mouths, appearing in two places at once and making a photograph of the face of Christ appear on film. Most of his manifestations have been demonstrated in front of highly respected professional people and are particularly well documented by Dr John Hislop, Howard Murphet and Stanley Goldburg. Michael Jackson and Sai Baba have two things in common -- both believe in magic and they love little boys. You might say they are spiritual soulmates. The Pundit, Mickey Ganesh has long forecast this merger of East and West. His throne is to be moved to Auroville soon. Sai Baba will be the "Mystic In Residence" at the Temple Matrimandir. Situated in the core of the colony of expats in that most magic of Indian States, Tamilnadu. This move will add further authority to his presence. 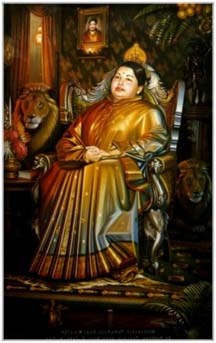 Home to Jayalalitha, the Iron Maden of Tamilnadu, the mistress of a Hindi Movie star. Jayalalitha; Actress-turned-politician has supporters that rally round the Cult of Celebrity much like Arnold Schwarzenegger or Sylvester Stallone is sorrounded by adoration. She rules her fiefdom with ruthless abandon using only a platoon of body guards and a custom-tailored flack jacket. It is assumed the consolidation of these entities will bring serenity to the fractious climate of Eastern India; the economy of scale will further streamline theology and politics into a unified theocracy for efficiency and stability. Lingams are great fare to materialize. Sai Baba must have the worlds largest colon as he can make these orbs appear again and again to the delight and pleasure of his devotees. He seems to never tire of magical stunts for an admiring crowd. Ad-nausium he demands attention whether deserved or not  he believes more is better  better and better is more and more. It's not like he's my kind of savior but, for some he fits the bill. Miracles come in all forms, Sri Sai Baba is into petty miracles, minor miracles and imagined miracles; a talent that has sustained him and his ashram for decades. Sai Baba is authentic in his trade. I had no idea that this Auroville place was so decadent. Sri Aurobindo would be appalled. I conversed with some followers of Sai Baba back in the 70s -- learned how gullible yuppies could be. Sai Baba seemed to be material for a Las Vegas magic show. Jayalalitha, the Iron Maiden of Tamilnadu has offered her protection and blessings for the installation of Sai Baba in the Orb Room of Auroville. With her power, the "arranged phenomenon" by the inner coterie of Aurovillians and the Avatar himself, a spiritual unity will reign supreme all over the world. . .
Sai Baba, the first living Non-Catholic to receive this honor. that's not Sai Baba, it's not Michael Jackson either, That's Bhagwan Al Franken. Saffron Robes give the perception of authenticity; a regal mantel to cloak the spiritual being, protection from beings that doubt the power of faith in the almighty whatevers. . .
As I ate my hot fudge sundae at the famous Hard Rock Cafe in London I noticed that amongst the rock memorabilia of the Beatles, Hendrix and Rolling Stones stood a life size photograph of a rather odd looking figure. But this fuzzy headed character dressed in bright orange/red is no rock star. He is Sri Sathya Sai Baba the guru of the blue chip multinational restaurant group and responsible for their corporate slogan 'Love All. Serve All.' Isaac Tigrett, the restaurant chain's founder, believes that Sai Baba saved his life when his Porsche careered at 90 mph over a 300 ft drop. 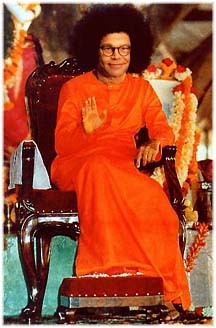 "Sai Baba appeared beside me in the car and put his arm around me. The car was totally destroyed but I got out without a bruise." When Tigrett sold his share of the company for £16 million he gave all his money to Sai Baba's cause. The proceeds of the sale helped build a free hospital in India. On his deathbed Pope John XXIII is said to have had a vision of a man that would usher in a new Golden Age such as mankind has never known. He described him as a small, barefooted man with brown skin who will wear a distinctive red robe. Similarly, the great 16th century seer Nostradamus and American prophet Edgar Cayce predicted that a holy man from the east would challenge the major religions of the world as a prelude to a Golden Age. Ten years ago few people would have heard of the remote tiny village of Puttaparthi set in India's southern state of Andhra Pradesh. Now the attention of millions is focused on this stone and thatched village because of Sri Sathya Sai Baba. Through String Theory, Anthropic Principle and the Gaia Hypothesis Sri Sathya Sai Baba has broken through to the eleventh dimension and is now onto yet more dimensions. With his invention of wing warping and worm holes, his insatiable desire for we humans to get it right has motivated The Avatar to extreme navel gazing and multiple bilocations. When asked why? He states, "Just to do neat things." He has levitated himself and others for fun, transcended large buildings in a single bound and risen the dead. The Atavist Avatar is equipped for more transformations through String Theory on screen. is to be immortalized in the Miramax Production: "The Avatar"
Starring: Leonardo Dicaprio, Judy Davis, Joaquin Phoenix and Tommy Lee Jones as Sai Baba. The film is in production in India under the advisement of Sai Baba. Harvey Weinstein is bullish on the project, thinking it to be an art film that has social content with entertainment value too. The Avatar: We can speak about the transformation and/or transmogrification of the self through the avatar. As the self expands to incorporate the avatar identity, the avatar identity penetrates the user identity. This process of transformation into online avatar is fairly novel, and it is too early at this point to draw definitive conclusions about its implications for self-identity. But we can already see some general features of avatar identity that may guide speculation. Avatar identities present both a positive transfiguration (Verklärung) as well as a less wholesome transmogrification (Verkehrung) of the human being. Both aspects belong to a larger picture in which virtual humans inhabit computer-simulated worlds. These virtual worlds show the first stages of an evolving transubstantiation of life, what has been called an ontological shift in the tectonic plates of culture. The virtual world is only now beginning to absorb the other media, and so we cannot know yet how far culture will go into the virtual dimension. The design issue for avatars goes beyond the "merely aesthetic" issues in the modern sense. If modern aesthetics locates design in the play of the senses, then virtual aesthetics reaches deeper than the sensory level to an ontological dimension because to conceive in the virtual is already to design something virtual and to fashion an identity is already to establish what and how something or someone is to exist in the virtual dimension. In the virtual, to create is to exist, and to conceive is already to design. Creation in the virtual is dynamic and never-ending. On the other hand, what is created is far more fluid and more fungible than anything physical. Because avatar conception is nearly indistinguishable from avatar design, we must look carefully at the initial assumptions behind the design concept. In the broadest terms, the current avatar design falls into three general categories: humanoid, non-humanoid, and humanoid transforms. Avatar design belongs neither to technology nor to art. It belongs to both. As Heidegger has taught us in his writings on technology, we are at the point in history when we must revive art as the very essence of technology. Techne itself contains the earliest meaning of art or skill, and to shape technology today is the noblest challenge of art. We are at a point far-removed from a self-absorbed aestheticism as well as from the haughty humanism that rejects everything technological as machine-like, banal, and beneath serious consideration. The three general classes of avatar design -- humanoid, non-humanoid, and humanoid transforms -- fit into a broader design issue. The broader issue is one that harks back to the question of representation in art. Thanks to the twenty student builders at Art Center College of Design who contributed over the past two years. Special mention to those whose work contributed directly to the works mentioned in this essay: Tom Mancuso, Simon Niedenthal, Joon Bae, Melanie Dunn, Fawn Stewart, Sung W. Kim, and Tobey Crocket. Thanks to Andy Davidson and the Department of Digital Media at Art Center whose financial and moral support made the author's work possible and often enjoyable. Dr. Christian Wessely of the Theological Faculty at the University of Graz, Austria, commissioned the talk that was the basis of this paper that was first given at a conference and seminar series at Graz University in June, 1999. Bhagwan Al Franken is now The Senator from Minnesota. Al Franken is the first Bhagwan to ever receive this distinctive honor. Senator Al Franken is commited to doing the proples bidding for Sai Baba and the People of Minnesota.